Wow! Where should we start with this? ‘Busy’ doesn’t begin to describe this gorged Cambridge. Making the most out of its limited budget by using a daring mix of fonts & eeking every shade out of it’s low-rent 2 colour print run, this is a curious beast. 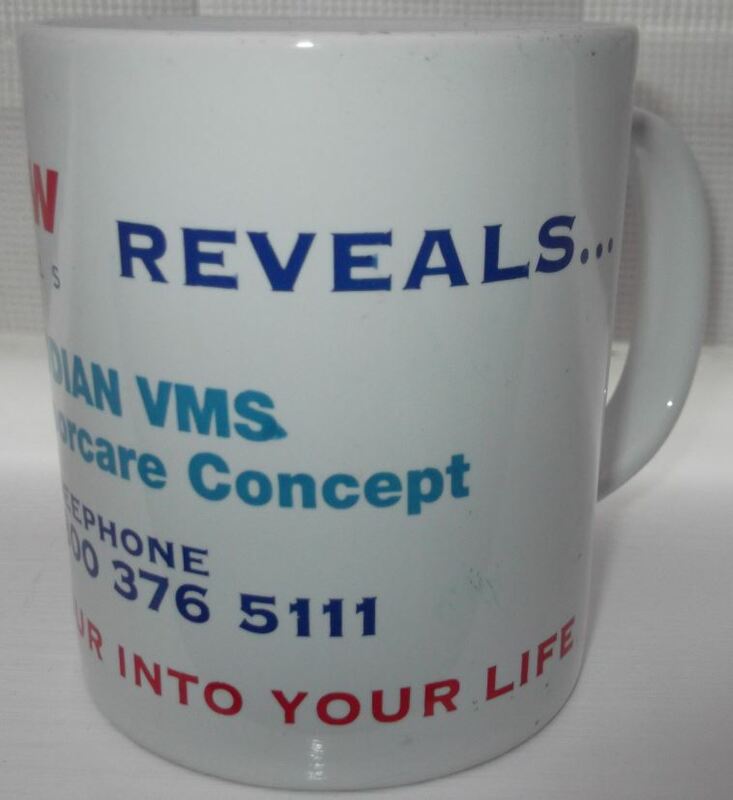 It’s packed with no less than 3 brands & contemporaneous info but the messages seem to drift around it’s girth and one could become was almost bored twisting it round just to get to the big reveal. It should be a classic but it just doesn’t work. The design seems to ‘hang’ and it could have done with some more graphic flourishes to hold it all together. https://www.youtube.com/watch?v=FG1e68ActQU. It’s an art-house flick e.g. all in French but don’t let that put you off. 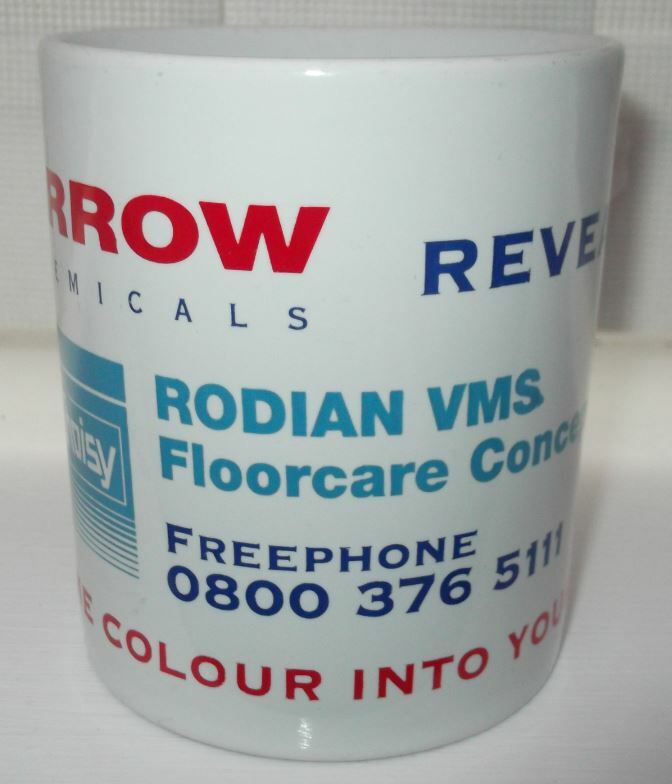 The strapline around the mugs base is also a bit deux-faced. 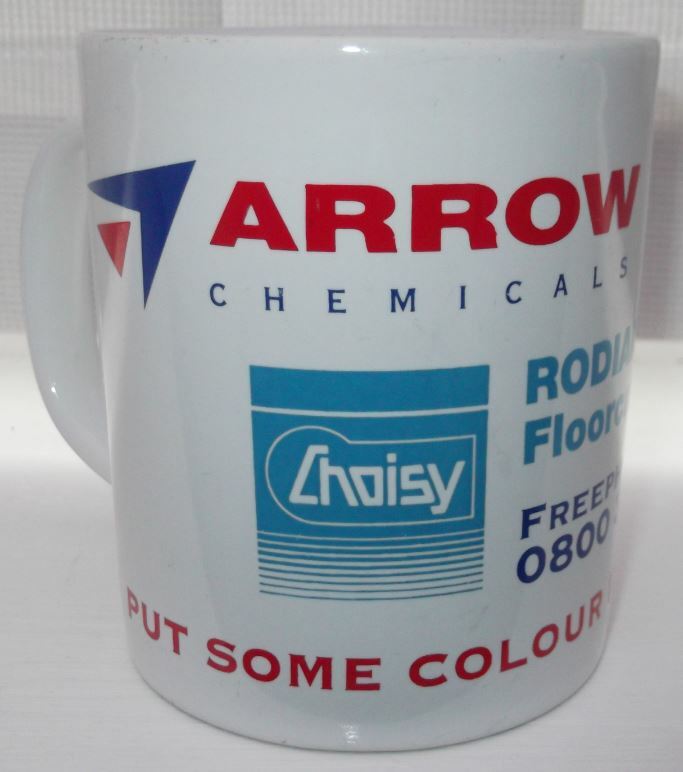 As for putting more colour into my life, perhaps Arrow need to put some more colours onto their Mug! However enough of the pleasantries. Here are some quick messages from our sponsors. Arrow Solutions was established in 1968, and supplies the UK and International markets with a wide range of industry leading cleaning and maintenance products. Based on our 16-acre site in Moira, Arrow works closely with our customers to produce the right product, every time. Arrow Solutions is committed to conducting business in an ethical and socially responsible manner, as well as ensuring the effective management of environmental issues. We are focused on sustainable development in order to meet the needs of the present without compromising future generations. (aka dream weaver & all round good egg) who foresaw the emergence of the whole new public hygiene industry. From the start, Choisy has focused on research, manufacturing and marketing of odour control products for various applications as well as specialized products for the dairy industry. Choisy Laboratories remains committed to its original philosophy: “quality and performance through innovation”. Choisy’s founder successfully laid the groundwork for a dynamic, innovative company specializing in hygiene products and related services. The company rigorously applies chemistry industry standards to growing public hygiene needs, with the expectation that more rational sanitation control methods will result in improved public health protection. Anyway, this post has taken an eternity to write. I think I need to crack open a window in here….